I make so many pies in the Fall, I think I can make pie crust with my eyes closed. The trick to a great homemade crust is to not over-mix or add too much water. Perfection comes from experience and trial and error. Combine the flour, salt, and sugar in a large mixing bowl. Cut the butter into small pieces, 1/2-inch squares or smaller. Add the butter into the dry ingredients using a fork or pastry cutter, until the mixture resembles small crumbs. Add the cold water, 1 Tbsp. at a time, and mix with hands until dough just holds together. Do not over-mix or the crust will not be flaky. Form the dough a disc and place between wax paper. Chill in the refrigerator for at least one hour. 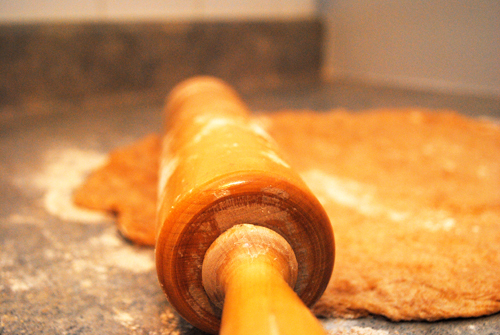 Place the chilled dough disc onto a floured surface. Alternately, place a sheet of wax paper on the counter and lightly flour the paper. Let rest for several minutes to warm-up slightly. Flour a rolling pin and roll dough to a 10-inch diameter circle. If using for a single pie crust, transfer carefully to a pie dish, using a spatula to lift the dough off the counter without tearing it. If making individual pies, roll the use a 3-1/2-inch diameter biscuit cutter to make small circles from the rolled dough.